OpenTSDB is a Scalable Time Series Database design to store and serve massive amounts of time series data without losing granularity. In this guide, you will learn how to use your first datapoints using Metrics. a valid OVH Metrics account. The full documentation is available at http://opentsdb.net/docs/build/html/api_http/put.html. As an example you can push single point. In the curl command below, replace REGION per your own one : gra1 or bhs1. As the user doesn't matter on the metrics backend, all the information are stored in our cryptographical token, you can replace or let DESC as if. If everyting happens correctly, the CURL would exit with a 200 code status. 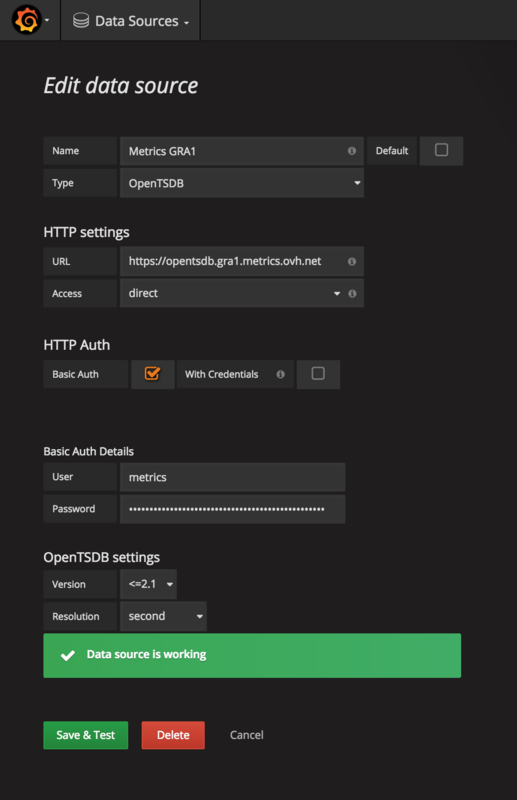 You can check that you correctly upload the data by checking your OVH metrics dashboard. In your home panel, you should now have 2 more active series and 6 new points added. Now let's retrieve the previously pushed data. What does compute this query on the series? The series are split according to the downsample parameter (4m-avg) starting from the end time. Then in each 4 minutes periods, compute the average on all values and return one result per period. This function performs a linear interpolation on the series and will fill each missing periods between the start and end time of the series. This provide only a series as result containing the minimal value for each 4 minutes periods. You will find more details about OpenTSDB downsampling and aggregation here. 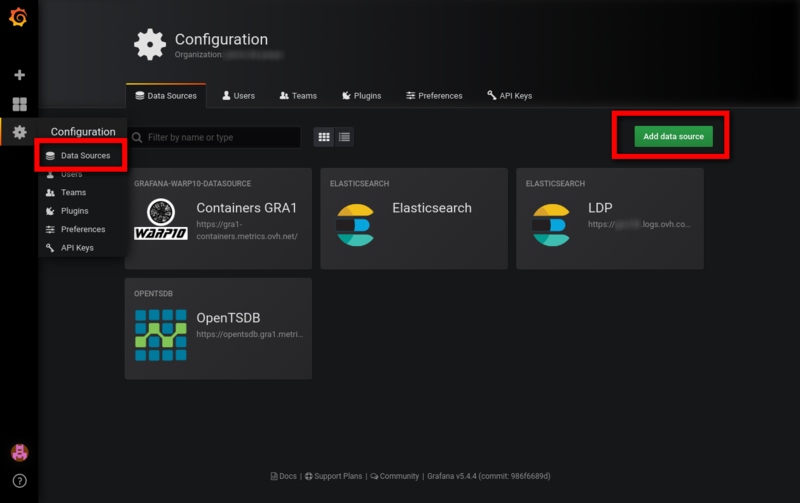 OpenTSDB is integrated with Grafana : Read more on OpenTSDB builtin data source. The first thing you need is to create a new OpenTSDB datasource. You can deploy your own grafana or create a new dashboard on the public OVH grafana. URL depends of your project region it's build as this https://opentsdb.REGION.metrics.ovh.net where region can be gra1 or bhs1. You can refer to the OVH manager top find your region. Basic Auth checkbox must be checked. user is not used, you can use metrics as basic auth. password must be fileld with a Metrics Read token. Tokens can be crafted on the manager. Then add a new graph panel, and choose your data source by his name. You can put your metriucs into the Metric name field. If you see too much variations and precision on your graph, decrease the Down sample interval. if your graaph is too blur, increase the Down sample interval. Then we add a query on the graph to query both metrics. You just have to put sys.cpu.nice as metric name, then fill each parameters to select the aggregator, the downsample and the tag. In our case we can do a single queries to get both cpu series just by adding the following tag host=*. Once you delete data in metrics, you will not be able to retrieve them. Be careful with this command. It will also not reduced your current count of daily points pushed. You can exchange with our community of users on https://community.ovh.com.